Permanent Account Number (PAN CARD) is now mandatory to register for all bank account holders. Yes, if your pan card is not linked with your saving/current account then you can’t make big transactions and also can’t use many online banking services. Good news for SBI (state bank of India) customers is that ” Now you can register your pan card online”. Yes, you just need Internet banking and follow a few simple steps, and you are done. (1) First, you need to visit https://www.onlinesbi.com, enter user id and password and login to your account. You can activate your SBI net banking online anytime. (2) After login, click on My Accounts & Profile and then click on Profile as you can see below screenshot. (3) In Profile section, you can see PAN Registration option, click on this option. (4) Next screen you need to enter profile password, just enter it. 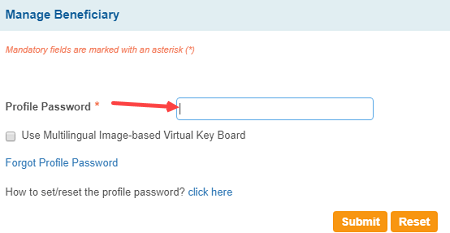 If you forget your profile password, you can reset it with your hint question & answer. (5) Now you can see your Pan number is not registered with your bank account, click on “Click here to register” and enter your Pan number and submit. (6) Now confirm your request, check again pan number correct or not. Once you sure hit confirm. Next step you will receive OTP on your registered mobile number, enter OTP pin and submit. That’s all, your pan card submission request submitted successfully, you will receive the reference number, using this number you can track your request. Your request will be forwarded to the branch for processing. The branch will process your request within 7 days. You can check the status of the request through the Status tab. So, this is the simple procedure to register your pan card number with SBI account online through netbanking. Answer: Yes. Netbanking require to do this. Visit SBI branch and apply for net banking. Q.2: I don’t have PAN CARD? Q.3: When my PAN CARD linked with my bank account? Answer: Within a week your PAN will be linked with your sbi account. Q.4: Bank rejected my request. Answer: Possible you have entered the wrong pan number, plz check. Q.5: Without Net banking how to link pan card with the bank account? Answer: Please visit your Branch and fill KYC form. please try again. if problem is continue then register complaint. hi I try to register My Pan through SBI Online net banking . I got the Status ” Reregister again ” . Now How can I proceed ? Any idea about that ?? Send your PAN CARD Photo or Attested copy to branch through Email Address. I submit my pan through Branch email address and it linked. If still any problem you can visit bank and submit pan card. 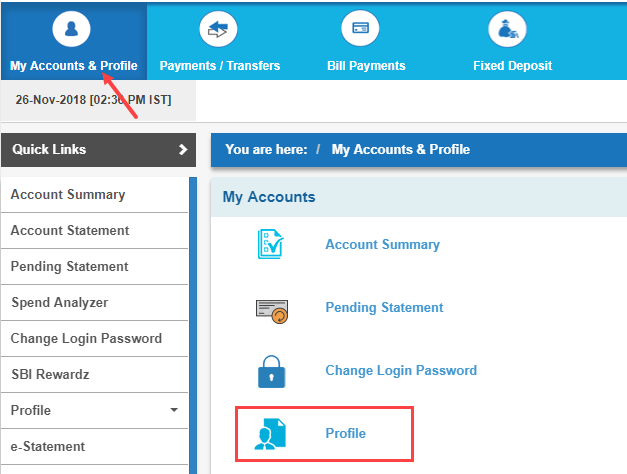 How to get transaction rights for SBI Anywhere Personal without visiting home branch. I have entered my pan number correctly(I have checked it several times) but still request gets rejected. This is the 3rd time it’s being rejected. Is it even possible to link PAN card with SBI banking account through email? What subject line did you use? What other details you put in email? Yes possible. I submit my pan card copy to bank email address and ask them to link. If your branch provide such facility then go ahead. What does the status ” unprocessed” mean ? What does the status ‘re register again’ mean? It mean your request failed. try again. I suggest you give your pan card copy to bank. You can also send pan copy via branch email address. I try to register pan with sbi online,few days after check status’expired’show what reason? Please use sbi complaint form to register your complaint.